« CFSF Consistency…Why do YOU work and others DONT??? CFSF Rules to Live By: DONT LollyGag! -Have you ever set your ab mat away from you pullup spot? 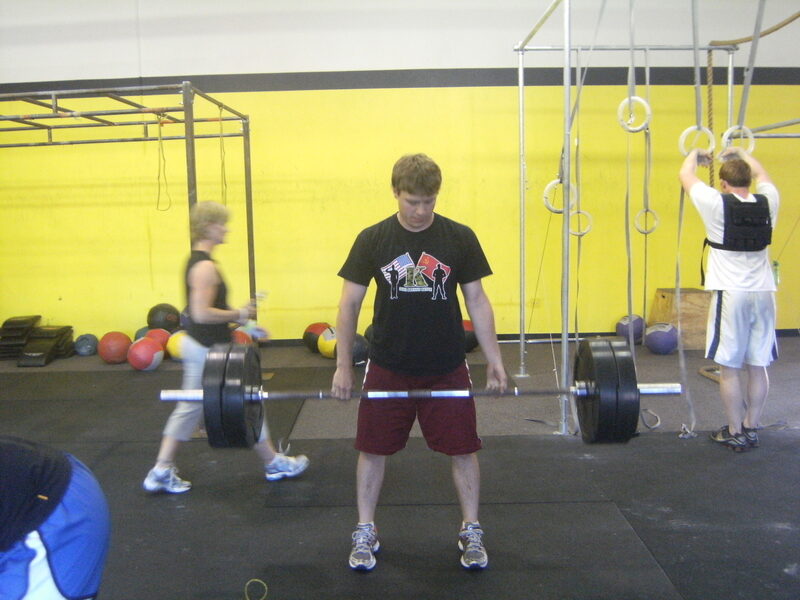 -Has your box ever been more than a few feet away from your barbell? -Have you ever moved slow to your next movement during a WOD (not bc you’re out of breath/or about to barf)? -Do you ever find yourself last to set up before the WOD begins? If you have answered “YES” to any of the following, you are GUILTY as charged of lollygagging! Yes…lollygagging, those people who just seem to move slow. Who are the last to have their bar or stations set up for the WOD. Who seem to take forever to change their shoes. Lollygaggers! I am not saying that these folks don’t work hard, certainly they do, but your body will adapt to the demands you put upon it. Specific adaptation to imposed demands. If you move fast, then you will be faster. -Lift heavy and you will be stronger. -Do agility drills and you will be more agile. Sometimes I stand right next to a lollygagger during the majority of the WOD, exhorting them to not step away, to get back on the bar, to move quickly and not walk from station to station. To a man (or woman), they have all been stunned at how much faster they can move. Move fast, be ready, charge it. Defeat your inner lollygagger. Where can you shave seconds in a WOD, where do you lollygag? –Journaling Your WOD is MANDATORY! 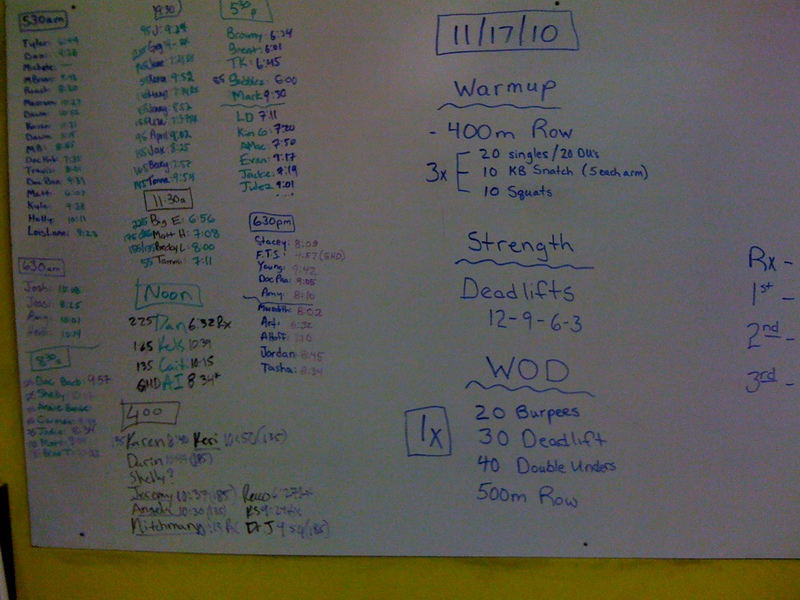 This entry was posted on November 17, 2010 at 12:30 pm and is filed under Crossfit Philosophy, Members. You can follow any responses to this entry through the RSS 2.0 feed. You can leave a response, or trackback from your own site. For example..last night I needed a little “RS” time instead of a little “Warm Up” time. Was it time well spent….yes. Did it help my WOD….no. I know in some areas I’ve been known to lollygag, but 98% of the time I don’t. Anyways to get on with my point…this was one of the days I was NOT lollygaging. “AHOFF GET MOVING!! !” and I will think back to what I have just expressed and moved faster, lift more and not screw around!!! THANK YOU EVERYBODY in advance!!! Thanks ever so much, “KG” glad you’ve got my back. Maybe Greg should just start coming to 530p? ….show people how it’s done! Seriously think this post is about me…. I am making a CHANGE crossfit peeps no more slacking off for me (for at least a week) I started tonight- Did the ENTIRE warmup, and didn’t stop for a drink of water during the workout!! LOL!!! I know some of you almost fell of your chair reading that last sentance! In all seriousness — I remember when I started crossfit I would do the warmup and practice moves that I needed to work on such as Double-unders, OH Squats…etc. Now that I have become friends with so many of you I feel as though I need my “gossip” time instead of warmup time. Hey Kimmy– Maybe we need to figure out how to warmup and chat at the same time!! Ok….the only reason you did not stop for a drink was so you could BEAT ME! Admit it….that is the truth! Hummm…..chat AND warm up. What an interesting thought! You guys are too funny…..this blog is such a HOOT! I miss Kylie….she used to warm me up….I mean, warm up with me. Kylie, WHERE ARE YOU? Come back!